In 2014 I had the honor of attending a three-day "community grieving ritual" conducted by an African wisdom teacher named Sobonfu Some’. Sobonfu taught us the importance of grieving in community. 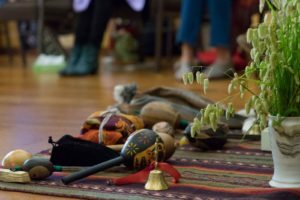 She showed us how to use ritual, symbolism, movement and singing to give grief a communal voice that rises up as a call to spirit to support us in our healing. In Sobonfu’s words, grief rituals help us to "regain a lasting sense of connectedness with ourselves and with spirit, and to find a proper place to release our grief about the loss of loved ones, the loss of our dreams and the loss of our connection with the ancestors." Sobonfu’s ritual was one of many stops on my journey toward a multi-cultural awareness of death practices and afterlife beliefs. Over the last ten years I’ve been trained in everything from the death traditions of Peruvian shamans to Freud’s “grief work” theory and the meditations of ancient Christian mystics. I completed academic degrees in religious studies and counseling, all while producing the annual Afterlife Conference, which enabled me to observe – and become friends with – some of today’s leading psychic mediums. Which brings me to my point… mediums and the grief journey seem like a marriage made in heaven. Literally. But the dots aren’t always connected. Because while an evidential reading with a good medium can bring tremendous relief when a bereaved person realizes her loved one still exists (in a different dimension), even in the glow of those precious messages from the other side, she finds that her pain still exists too. Because while a reading may be able to shift the weight of the pain toward a new balance, nothing can make the pain go away. When we focus too much on trying to deny, dismiss or defeat the pain of grief, we hold healing at bay. In order for the pain to be transformed, it must be honored, embraced and lovingly cared for, because like the messages a medium brings from our loved ones in spirit, the experience of loss, grief and mourning is also a sacred message. It calls us to go deeply within, using mystical tools beyond what conventional grief counseling or support groups can provide. By participating in rituals like Sobonfu's, we find the places in ourselves where we have the ability to shift the contracted energy of “stuckness” to an expanded energy of acceptance and spaciousness. We are given practices that help us break through suppression, denial, blame, guilt and anger so that we don't live in the pain, but we live with it as a companion and teacher. Thank you for this explanation of dealing with grief in community. I lost my sister last summer and my mother a few months ago. I moved from Chicago, my home for 44 years to Ky last year to be with my sister and mother and left behind my lifelong friends. It is a lonely time trying to make new friends here. I would like more information on how to meet and work with Sobonfu or someone like her. I feel like I could help you. I live apart from my children and I live alone. I am still grieving the loss of my boyfriend who passed away three years ago. I still struggle though I am getting back into my meditation and I am a light worker. I could help you with healing. Where do you live, country, state, city, and where do you need healing the most?? I can place it anywhere it needs to go. Send me a message via messenger as I rarely check my email. I seem to be coming from a unique perspective so I need to understand grief better. You see, my first experience of a person passing on was my identical twin inside the womb. ( Yes, I could write a book about all these experiences!) She said she was “going now.” Going was a new concept as everything before this had been in the Now, present tense. I knew that the Unseen Ones that taught us were calling her. I was intensely attentive to understand what going was. Up until now I had thought that we were the baby that was to be born. As she rose up to my right, I noticed that the light cord was absent… then … transcendent music, color, light and everything went brilliantly into ecstasy. When my body couldn’t sustain the beauty, I dropped to my left into the peace that knows nothing but peace…. so you see, how can I grieve for a loved one when they are in the Light? Thank you for your insight. I am a psychic empath, clairaudient and clairsient, I lost my clairvoyance when homeless though am working to gain it back. I have only just restarted my meditation practice’s. I am a great channel when clairvoyant. I am able to carry spirit. Meaning that I have the ability to keep the unseen with me either until I have a shamanic crystal healing or I can use spirit quartz to lift the unseen. I am currently having difficulty letting go of my deceased boyfriend Chris. Chris was killed suddenly in a tragic vehicle accident. He was the pedestrian passenger on a motorcycle when the young rider drove out in front of a 4wd travelling at 100 kmh. The rider was killed instantly. Chris went up onto the windscreen, and under the car. He had crush injuries and he died within 35 minutes of the accident. We had been together for only 9 months but I knew when we met that he was the only one for me. It’s been three years since he passed on and I feel like it was yesterday. I cry lots and I find it really hard to let go. I don’t want to but Chris wants me to move on. He does not like that I’m not doing so well. He wants me to move on in life remembering him lovingly. I learnt about spiritual egg cleansing and I plan to do it to myself this evening. I am struggling badly in life in general and I could do with something different. Besides, I was hexed five times by my last neighbour because she was jealous of my skills and abilities. I removed them though she is constantly hexing me. Once again thank you for your insight.